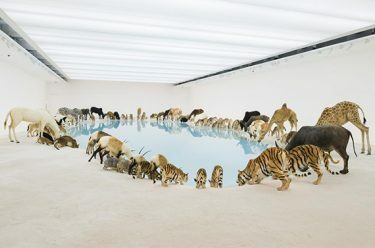 While developing his exhibition ‘Falling Back to Earth’ at the Gallery of Modern Art, Cai Guo-Qiang undertook a series of research visits to locations around Queensland. On one of these trips, Cai, his family, and Cai Studio manager Kelly Ma took a tour of Lamington National Park, near the Queensland/New South Wales border. This extraordinary reserve contains remnants of Gondwanan rainforest, such as the majestic Antarctic beech, dating back to when Australia was connected to Antarctica, India, Africa and South America around 200 million years ago. The sense of vast scale and deep time that these trees evoke was a major inspiration for Eucalyptus. Cai always carries out local research when developing his projects, tapping into elements of history, culture and society at the site where the work is made. This provides connections to its location and audience, while also leading back to his own experience and Chinese heritage. Cai’s focus in Queensland was to gain an understanding of the natural world in particular. The unique, ancient and relatively pristine environment of South East and Far North Queensland made a huge impression on him, encouraging him to reflect on its relationship to the rest of the world, along with humanity’s broader connection with nature, which is undergoing enormous challenges through environmental degradation and rapid urbanisation. Eucalyptus 2013 was conceived by Cai as a quintessential element of the Australian landscape, transposed into the Gallery of Modern Art like a vast readymade. The work is both literal and metaphysical, encouraging meditations on its existence while being overwhelmingly direct and present. Neither lying on its side nor upright, the 31-metre spotted gum tree is suspended on an angle so that it soars up from its roots, between weight and weightlessness, ground and air. 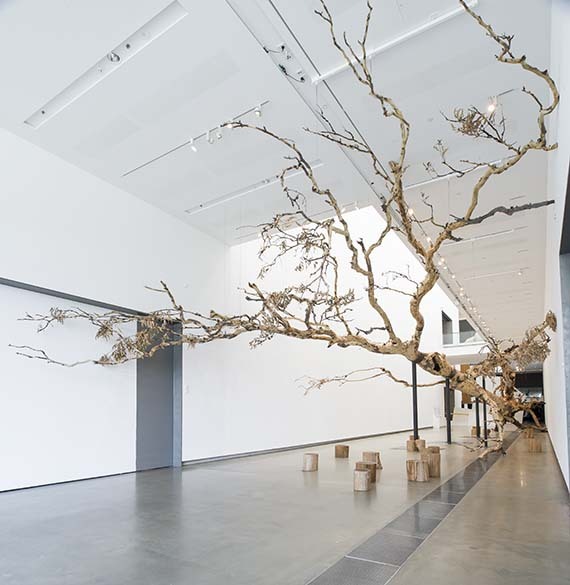 Visitors encounter the base of the root ball on entering the space, as if looking up at the tree from below the ground, and from the other end can look down the trunk of the tree from its branches, as if floating in the sky above the canopy. We have the opportunity to get to know this tree intimately as an individual rather than part of a mass of trees, and contemplate it as an aesthetic experience, not unlike the scholars who painted and wrote about trees, mountains and streams to create the great works of Chinese art and literature. The Gallery’s challenge was to find a tree that was earmarked to be removed in the near future. This took some time, but a suitable tree was located in Springfield, in a zone allotted for clearing as part of the Springfield Lakes community development project. This long and complex process is considered by Cai as an essential part of Eucalyptus, with the gallery installation one point along the tree’s journey. He sees it as essentially unfinished, with audiences contributing to it by participating in an activity designed by the artist with the Gallery’s Children’s Art Centre. Visitors are invited to respond to Cai’s proposition, ‘If this tree could be anything at all, what might that be? Compose a poem, draw a picture, or write a message to Cai about your ideas for the tree’. The wealth of ideas and images that has been generated by this proposition is fascinating and inspiring, expanding the work into numerous potential directions, like the winding branches that splay out from its enormous trunk. Eucalyptus is, by Cai’s own admission, the most open-ended work in ‘Falling Back to Earth’. 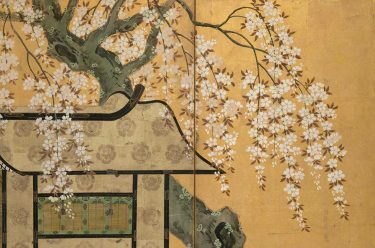 It defies easy description – to me the growing archive of vastly diverse impressions, proposals, hopes and reactions is the most accurate way to explain it, rather than any curatorial statement or essay. In other words, you need to see it for yourself. A richly illustrated catalogue accompanies ‘Cai Quo-Qiang: Falling Back to Earth’ and includes spectacular photography of the installations.